Bats are dying by the thousands from a highly contagious disease called ‘White-nose Syndrome’. The hibernating bats are struck with the illness which causes them to loose body fat and die…while hibernating. We are talking thousands of bats per; over ten thousand at a time! 10,000 animals littering the floor… Highest hit are the Little Brown Bats, but several species are affected. No big deal, you think? Who cares for flying rats anyway, you say? Consider that individual bats are responsible for consuming as many as 1,200 insects per hour or about a third of their body weight each evening. Now we’re talking as many as 7,000 bugs per evening per bat! Bats consuming many insects that might harm our crops and keeping a handle on the spread of diseases from mosquitoes. More than one resource suggests a connection between the fungus and Fusarium…an agent used to kill unwanted crops. (See: http://en.wikipedia.org/wiki/Fusarium_oxysporum ). Let’s consider the bees for a bit. ‘Colony Collapse Disorder’ is what is causing thousands of bees to suddenly leave their hives and die. Beekeepers became alarmed over a year ago, when they suddenly had to purchase bees to fulfill contracts to the farmers they serve. We’re talking hundreds of thousands of dollars here, and millions of bees. The bees are stressed; it’s a big job servicing the thousands of acres of a single crop at each mega-farmer’s business. The bees are trucked; hive and all, across miles of highway to help pollinate crops that otherwise would be too much for local wildlife to cope with. We’re not just talking less honey, here; a full 80% of our food depends on these commercial honeybees! And now bananans…had you heard our favorite fruit might be extinct in 10-30 years? Yes, because we eat primarily only the Cavendish Banana, which is suffering due to the spread of what is called the Panama Fungus…the whole banana-market is at risk of collapse. Panama Fungus or a disease called black Sigatoka are attacking the plants and causing them to die off. The bananas we currently favor have lost the ability to make seeds…so the huge die-off is a big deal. Spraying for the diseases are causing higher than normal incidents of leukemia and sterility in growers. Go figure. Oddly, some third-world farmers are saying the problem with their crops is the poison the US sprays in a futile war to rid the world of coca… a poison that affects the very earth they plant their crops in and which affects the crops just as it affects the coca…with a kind of wilt and eminent death. Clearly I am no scientist and just as clearly one can see I am a left-wing, tree-hugging natural kinda-girl who is more than passionate about the world and how we abuse, I mean, use it. I just do not understand. It seems to me we are the only animal that fouls the bed it sleeps in! Please think about it when you grab the can of Raid or spray your roses with anything more than a bit of soapy water. In the midst of the economic crisis we are suffering, I heard one town decided they couldn’t afford to spray for mosquitoes; and the people are up in arms over it! I think if we would each just take a little personal responsibility…the world would be a cleaner place. LEAGUE CITY — Every year, just as the Texas heat begins to simmer down, Kim Rouse and her family wait to hear the familiar, throaty squawk. Up in the sky, tiny gray dots spiral down until she can see the long necks, wobbly bodies and narrow, pointy beaks. The sandhill cranes are back for another season, ready to roost in the marshy, open field along the interstate. Now, with just a few weeks left until the peculiar birds head north for the summer, Rouse is preparing to say her last goodbye. Next year, the field where the flock has congregated will look like the land around it — more houses, backyards and subdivision streets. Work has started on the Sedona subdivision — a neighborhood with 221 homes on expansive 10,000-foot lots. 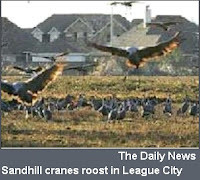 The homes will occupy the 70 acres south of League City Parkway and west of Butler Road where the long-necked birds roost. I much prefer what Colorado was able to pull off; behold the birth of a new National Park: The Great Sand Dunes National Park and Preserve. One of the best parts is it’s located just about an hour from my home! Yesterday I saw my first American Robin here this year. I’ve seen them in Walsenburg for a month now, but only just heard them here last evening. Their song is so distinctive; I had to go looking for them specifically…just to see if I ‘knew what I heard’. 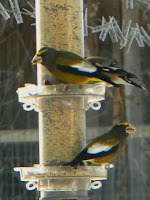 A couple Evening Grosbeaks visited again. A book I borrowed from the library finally confirmed the ‘greenish bill’. An Audubon Handbook of Western Birds by John Farrand, Jr. put it in writing. I’ve been spending a lazy day today in front of the window; watching birds. I believe I have Savannah Sparrows here, as well as a rather shy House Sparrow that grabs and darts food much like a Chickadee. The pink-butts, as I call the Rosy Finches are not around today, but the Cassin’s and House Finches continue to come every day, all day….just like the Juncos, Pine Siskins, Goldfinches and Woodpeckers…oh and the Eurasian Doves. I thought it odd when I noticed a dark lump in the trees and with the binoculars discovered a Red Tailed Hawk in the yard next door. I watched it for about five minutes, but all the little birds didn’t seem to mind it being there. Perhaps it is more interested in squirrels and rabbits than small birds? Funny, I’m trying to teach myself how to take mental field notes when I watch a bird. Watching this one, I discovered they ‘projectile poop’! Who knew! One last thing. The other day I noticed a blackbird type bird; same size as a Red-Winged Blackbird or a Yellow-Headed Blackbird…but without those color markings. This one had a thin, white shoulder line and I could swear I saw the tiniest bit of red when it took flight. I’ve never even heard of a Tri-Colored Blackbird, but saw on Bill Schmoker’s photo collection (You'll find his Tri-Colored Blackbird in the Dickcissel & Blackbird album). THAT was the bird. Since then, I’ve been told the bird has never been seen in Colorado; that I must have seen a Red-wing. Do they sometimes come with so little red I almost missed it…or with the conspicuous white shoulder markings on an otherwise black bird? Here are some lovely photos of what I believe I saw...the second page shows the way the red shows-up when it opens it's wings. I saw absolutely no yellow. I borrowed the books to check it out. The only other bird I could imagine it might have been is a Lark Bunting…but with hardly any white on it at all; just a thin patch on the front of the shoulder. As the one who called me on my probable miss-identification...birds don't always follow what the guide-books suggest! LOL What I need is a birding pal! It turns my stomach when I hear that noise; the horrible thud of a bird hitting my window. I run out to pick the bird up before cats can get to it, if it has fallen and I can find it. They do not, anymore, always hit so hard as to fall, but in the past I have found a raptor, several hummingbirds, all manner of songbirds at either my cabin or at this new home…and last week, a chickadee which died. I nearly cried. While most birds, including the raptor and several many hummingbirds, seem to recover just fine after about an hour in a dark box in a quiet corner…I understand at least half recover enough to fly off and die later. It’s too sad. I think it is both disgusting and irresponsible to let this happen. Having said that, I am balking at what is touted to be the perfect solution; a film, the same stuff you see on buses these days, applied to the outside of the window to remove the reflection a bird sees from the yard. You know the stuff, they paint it with advertising on the outside yet people inside still enjoy the view out. While waiting for the sample, I hung (quite loosely; thinking the folds shifting in the wind would help) black bird netting outside the large, murderous kitchen window I just had installed to watch wildlife in my yard, as well as over the old back-door with all it’s small panes. And talk about a pain! I imagined the netting was temporary, and so it requires regular re-application of tape to hold it up against the window. The stuff is also ill-fitting on the door, and sometimes snags my (very large) dog, on his way out to scatter squirrels that eat at my feeders. I want to not only watch, but photograph birds from my big, new kitchen window. The netting gets in the way…but not badly; my and my camer's lens seem able to focus past the stuff (when I use the camera properly, I mean.) Having applied a 1-foot square of this new film to my window, I am completely discouraged…and feeling guilty as the dickens. I hate the stuff! My window is 4’ tall and 5’ wide and is flanked by two more angled to the side. The other two have screens which make viewing and photography more than difficult. This film is worse than the window-screening! I hate it. I like the fact that my bay-window is south-facing and allows the sun to heat up my new porcelain floor. This is Colorado, after all…and solar heat helps! Besides, this film is stark white from the outside and black on the inside. In spite of the very many holes in the stuff…it makes the room considerably darker. I was told it cuts down on UV rays. Well, duh! I bet it’s dark enough to contribute significantly to SAD, too. I can see applying the stuff to huge office buildings where people don’t sit dreamily looking out the window for hours while watching wildlife…but I just don’t think it’s gonna work on my windows at home. Dammit, I was so hopeful, too! I am wondering if I might find something in a slightly tighter ‘weave’ than the bird netting. By and large, I cannot really ‘see’ the stuff from inside my house, but I suspect even if it is drawn taut, birds will hit the glass. I have imagined building different frames to hold the netting, to keep it tight and yet using hinges to move the frame out of the way and allow cleaning of the window. Perhaps if I build a frame that holds it maybe 4-6 inches away from the window? I wonder if that would stop the poor things from hitting the window…and not propel them backwards into the pond I hope to build! OMG…what a thought! I don’t think I can darken my new kitchen after spending so much to get it; it would be too depressing on so many levels…and the netting is making a pretty good difference already. Still, I hate how many birds deaths there are, for which I’m responsible. Has anybody an idea how to resolve this dilemma? I sure would appreciate help. Finally, I have some pictures of those rosy-butts! (albit them still not very good.) I just knew I was looking at Gray-crowned Rosy-Finches a few weeks ago, but I never got an even slightly decent picture of them. As you might know, I’m trying to take pictures through a window which has bird-netting over it. I am sick to death of birds hitting my windows; even this netting isn’t 100% and while I said I’d not try to take more pictures this way, I had to put some of these up. I may, or perhaps not, have learned the difference between the three little red birds I’ve discussed before and to be honest, I had begun to wonder if the pink-butts were a figment of my imagination; but NO! Viewing them through binoculars and looking at pictures Bill has on his site…I am watching Gray-crowned Rosy-Finches. Yippee, I’m learning…but I so need a spotting scope! Maybe I'll put a down-payment on one with that check I’m supposed to get from the George. Well Crud! So, I eagerly waited for and found Bill Schmoker’s post this weekend and was blown away. He saw a bird that isn’t found in Colorado! LOL And his joy was as apparent as was his generosity and humbleness; he teaches us to make room for mistakes, to consider another’s opinions and to find all the fun he does in ‘the birding lifestyle’ and all its ID debates and sometimes surprising resolutions. In other words; remember The Power of Suggestion! 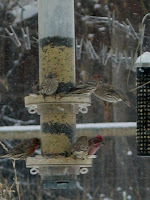 Yeah well…all that is very nice, especially when I consider my difficulty with the little red FINCHES. But now…well, I broke down and went to the library (gawd it galls me my books are still in boxes!). But, what is this I find: Sapsuckers LOOK LIKE WOODPECKERS! I have been under the strong, confident and totally misguided (read that wrong) impression Sapsuckers look like Flickers! Dang!!! How do you people figure this stuff out? I’m looking through Birds of the Central Rockies by Jan Wassink and find both Yellow-bellied Sapsuckers and Williamson’s Sapsucker look a whole bunch like both the Downy and the Hairy Woodpeckers. Arrrrgggggggggggggg!!! Well, I’ve given up trying for photographs for awhile; but I can tell you the black nylon bird-netting I’ve hung over my big kitchen window (and the back door with the 15 little panes) seems to be working. My dog, who knocks at the back door to come inside, pulled down the loose netting and before I could get it back up, I’ll be darned if yet another bird hit the glass! Arg!!! The netting is ugly and loose; I’m trying to make it exceedingly easy for a bird to see the stuff and its working. More than once, I’ve seen something scatter birds, one or more heading directly for me, sitting inside, only to veer off well before they hit. I like this a great deal, but it’s totally messing up my photography…actually looking through the window ya hardly see the stuff, but the camera does. The netting is the stuff one can put over a tree or shrub to keep birds away from fruit. It seems quite robust, but as the snow melts, it forms icicles on the netting where it’s not against the window, the weight of which pulls down the netting. Sheeshhh, it is temporary, but it gets old taping over tape every other day! Soon the sample from CollideEscape will arrive…I’ll tell you all about it when it does. I was curious if it matters which way I hang the film (it doesn’t) and just how stark it will look from the yard (you can get it printed with just about anything…but that costs more). I rather like how the sun heats up the porcelain tile floor I have in the kitchen, but the film will cut down on UV rays. That’s a good thing, right? But can I really see through it? Can I learn to focus my camera past it? So many of my most recent photos show the webbing shadowed in each attempt, making my shots look even more childish than they really are. I’ve been avoiding paperwork. I am the worst at sitting down and writing checks. I have no idea why…except that perhaps I’m afraid I’m not going to have enough money to pay all that I owe. Times are getting a bit scary; the utility bill at the shop, usually less than $80 for a month, was more than $350 for the thirty-one days of January. I find that scary; how does the cost of heat jump over 400%? I do not want to loose another 2/3 of my ‘retirement’…I have no idea what I would do were that to happen again. I’m going to go watch birds for awhile. I’ve spent several long sessions at the kitchen window avoiding paperwork. At one time, I watched three Woodpeckers (both male and female Hairys and a little male Downy), two White-breasted Nuthatch, a bunch of Juncos, two or three Chickadees and the ever-present Eurasian Doves. I love the woods around here; they are thick with birds and offered up yet another I had not seen before. Well, perhaps I have but I failed to really notice it, other than to realize it looks much like a chipmunk with its rich chestnut and white-stripped body; the brown being much richer than so many of the other little brown birds. I will teach myself to look at birds. This bird, though, had a black or velvet-grey crown and dark bib, with white cheeks and still those stripes of brown on its head; like a chipmunk. These days I try very hard to notice these things so perhaps I might identify the bird later. I remember telling myself: ‘black head and bib, white cheeks.’ The closest I found were the Harris’s Sparrow, though there was brown on its head, flanking the dark crown, and the cheeks were white...and there was the very dark bib. I wonder what it was…this little bird that only eats from the ground. Okay, kidding aside, if anybody has a clue what this new little brown bird, here in Huerfano County (early February), might be…please leave a note. I’d appreciate it. Oh, and I discovered two things today; a Slate Junco is not a Black Phoebe, and I could have Pine Warblers at my feeders. I recogonize the Siskins, and perhaps the American Goldfinches...but the olive-green backed, bright yellow-breasted little things might be Pine Warblers, no? I feel like The Bad Seed; I need to be careful what I wish for! Sure, the Blue Jay was a somewhat unwelcome visitor the other day, but I just hoped it wouldn’t nest in my yard…that’s all! I went off to work yesterday and found the driveway littered with blue feathers and pieces of wing. I am so sorry, fella. Raptors gotta eat too though, huh? 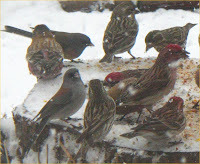 I believe I’ve figured it out; I have House Finch and Purple Finch regularly visiting my feeders. Sherrie tells me House Finches "are EXTREMELY variable", so perhaps that is why some are redder and some International Orange, like this guy. These photos are not mine, and appear on each bird's profile page on the links I've provided..but are wonderful illustratons of the three (?) birds I see here. They really do seem, to me, to be quite similar…but the Purples have an all-over pinkish tint to them and are nowhere near as stripy. It might be possible I have Cassin’s Finchs here as well…there are a few who seem to have an especially bright red, and quite ‘spiky looking’ topknot. While the female Purples look like little winged ground-squirrels with their brown and white markings, the females that could be Cassin’s puff up their topknots just like the males, like this female Cassin's is doing here. Here is a fascinating discussion on the three birds and how to Distingush the Differences. Lovely birds, all. Last evening I came home from work and got out of my truck to the sounds of owls. I love that sound, it is peaceful and wild at the same time…like the call of a loon on a quiet night. I just love it. I think it is a privilege to live in such a wild area. Sure, it’s not the cabin…but I don’t have to worry about tipping over my truck with a full 200 gallon watertank while sliding sideways down a hill or plowing out three miles only to discover the county road wasn't plowed yet. Those were the days! A friend glimpsed a mountain lion in town the other day, and was upset about it. 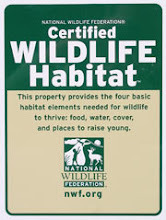 I wonder why people move to areas like this and then want the wild animals removed. I remember a young family moved to a home several miles from town…to raise goats. When the lions came around they put pet dogs inside and called in the bounty hunters. Yup, killed eleven big cats one season! Of course, doing this just brings in lions from further away…and perhaps larger litters for a year or two; but solves nothing. I just do not understand why more ranchers don’t use LivestockGuardianDogs. Zeus is the best! He's an Akbash Dog, an ancient Turkish breed, who thinks he's Hispanic. Hey, Zeus! I talked to friends about the owls; I understand only some hoot, which is what I regularly hear here. Apparently we have quite a variety in the area, including Great Horned Owls, which is what I believe I hear. 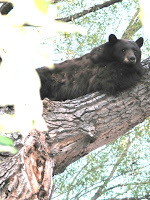 I have never seen one here, though I’ve begun scanning the treetops across the road, along the river, where I hear them. Perhaps I need a scope. Yeah, that’s it; I really do need a scope! There are fourteen kinds of owl in Huerfano County. BirdChick has a wonderful (and educational!) little video clip she created and put on her blog Feb 1st. Thanks, Sharon! There are several bodies of water aroundthe town of La Veta, and of course at Lathrup State Park. I’m going to have to start looking for loons, too. I know the eagles find ‘em! 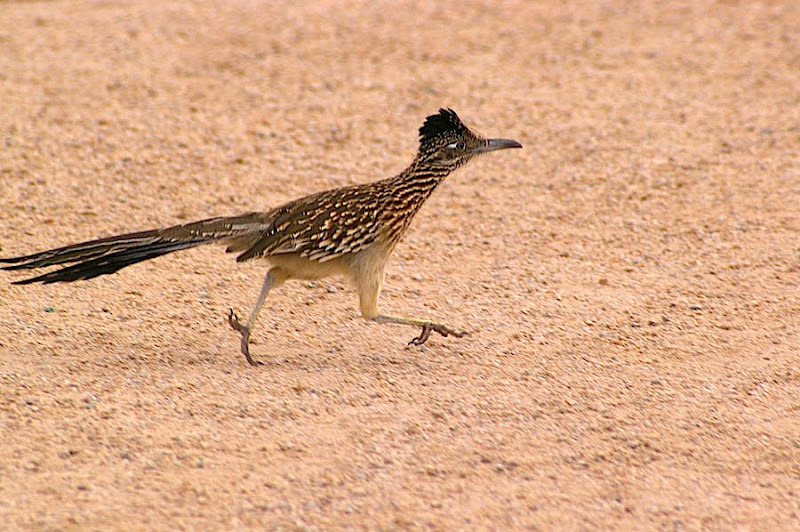 Did I tell I once saw a Greater Roadrunner running fast across the highway near Lathrup...I half expected to see that wiley coyote in hot pursuit! And we did get snow...in fact it's still snowing. Looks to be nearly a foot of fairly heavy stuff. Yippieeeeeee Of course I stayed home and watched birds out the window, replentishing the feeders as needed. And I finally saw more than one White-winged Junco at the same time...thrilled to learn it is a 'rare' bird...only to have my thrill dashed by not finding it on Colorado's RareBirdAlert. Sometimes I'm too wierd. Well, my feeders were just buzzed by a big, dark Steller’s Jay…crest flying ‘full flag’, or I might have thought it a small crow. He darn near landed, twice flying low over a stump upon which I regularly pour seed, hen food and black oil sunflower seeds. I’d prefer he not stay; I remember in Denver I had one nest in a backyard tree that regularly whacked me in the head when I went out my back door. I’m a gardener; it was a pain in the…head. Speaking of dark, I’m learning reading about ‘morphing’ colors in birds on Bill Schmoker’s site. Perhaps that explains the ‘orange’ versions of the little red birds I have here. 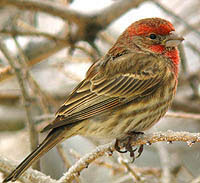 It is astonishing how different they look, but I’m betting they are the same bird…a House Finch. Here is more about Bill’s enthuasism for dark-morphed hawks, including even more astounding photos! Thanks, Bill. About morphing, I saw Slate-colored Junco with white wing-bars. It, or they, are quite different from all other Juncos that frequent my feeders. I remember Bill Schmoker talking about them on his blog, but do you think I could find the reference? No, but here is another regarding the White-winged Junco. 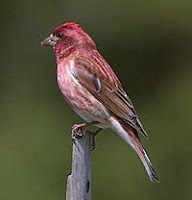 I’m convinced though, that the pinkish-cast birds are something different…probably Purple Finch. Some pictures I see of them are quite dark…the ones here are pale, but definitely purplish allover, exactly like the photo at the Cornell site. It is pretty embarrassing to be blogging birds and have no idea how to identify a most common bird. I feel better when I see my favorite birders put question marks by their photos. LOL Still, I believeI also saw a brown-capped version, too. I wonder why ‘Whatbird’ seems to find them non-existent in Colorado, when so many mention they are here? Heck, just checked Cornel,'s maps...looks like they say they're not here either. But...this is the bird at my feeders! Oddly, both a Hairy Woodpecker and a Chickadee stayed right at the feeders as I came out the back door…only some 15-20’ away. Dang, who knew? I’m going to have to get a chair out…and stop trying to photograph through the windows! We got 3-4” of snow last night, and while it’s sunny this minute…everything is drippy wet. Looks like more snow and judging by the birds’ voracious appetites it must be so. Snow is eminent, I heard on the radio today…and so you’d think by the way the birds went through the feed. Even the woodies seemed to be stocking up, they were here a lot. I need to win the lottery. I suppose first, I should discover what it is, really, that I need to improve my photography. Is the problem my window or is a PowerShot G3 just not good enough? I’ve read to use a Digiscope one must have at least a 4.0 mega-pixel camera. Mine is just that. Perhaps it is the ‘telephoto lens’ I got for it…all excited that I was to even find a digital camera with an interchangeable lens…seven years ago, mind you. Gads, I have so much to learn…but first I have to fix the window! I have links regarding the scopes on the right side of the page. The wind was blowing too, so it was hard to get the camera focused, but I did get a couple more little shots of the Nuthatch who visits, as well as one of the woodpecker types. I believe I have two; both a Hairy and a Downy …as there is a big difference in size, but I think both have red on them. I’d imagine females do not.I miss being up at the cabin…I remember once hearing cranes fly overhead; I thought I was hearing chickens! They fly so much higher than do geese it took awhile to find them, chattering on their way to the dunes, I suppose. I used to watch wild turkey chicks with their mothers right outside my window; it seemed nothing was afraid…I guess they didn’t see that many people up there. It was so lovely to wander around and look at stuff. I once saw a bear with a blond strip down it’s back…it looked like a punk-bear the way the blond looked in dappled sunlight. 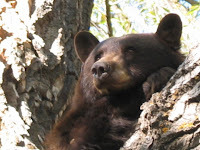 I found out later that our black bears are not just black or cinnamon…but sometimes have patches of blond; stripes down their backs or bibs under their chins. My friend Tony says I can go back up and hike around his place. He and his family bought a place mile or so past my old cabin. I’d love to arrange some birding trips up there, when the snow melts. 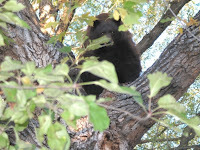 I was asked to post a couple more of the pictures I took of the bear that spent a day in a tree in my front yard. They are fairly tolerant here, as long as you ignore them; but they drive my dog, nuts. He’s a Livestock Guardian Dog, an Akbash Dog, that I got when I thought I was going to spend the rest of my days in Paradise. I watched him keep a double-tagged bear (bright yellow tag in each ear means it was becoming a problem) out of our meadow all by himself. LGDs don’t hunt or harass bears, wolves, or lions…but they do run them off when they come around. Such a good doggie mine is! 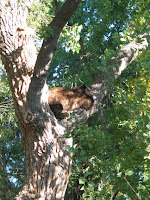 Here are the pictures I took of the bear who was hanging around ...and you thought birds were messy! These guys come to town to gorge on apples, and the piles they leave are humongous! Okay, I understand I have to learn how to use my camera…but I do have issues, too! While it’s not a bad little camera (seven year old Canon PowerShot G3 for which I have a telephoto lens), I am shooting through that blasted window that I’ve draped with netting. Perhaps things will get better when the film from ColideEscape arrives. I can learn to control my own camera (!!! ), to focus on the bird and not the window. I can, I can. red birds, as I call them. I cannot determine if the more stripy ones are the same breed the buff-breasted ones. If anybody can tell me if they are the same and what, really they are, I’d appreciate it. (Really, I’ll get my books out of storage as soon as I get my floors repaired and book-cases made). who visit my feeders. I believe I’ve seen two kinds, Mountain and Black-capped; the little buggers are fast! A Mountain Chickadee was the last fatality at my window…when I finally put up the netting. I did get a couple bad shots of another little nut-eater… I swear, I am going to learn to take pictures; I'm sorry these are so bad, but if you can help me identify the little red ones, I'd sure appreciate it. Also there are links to Indices from Birds of Nature magazine, a hundred years worth!!! Wow, thanks, folks. Bugs Catch and Eat Birds? Who knew Preying Mantis eat hummingbirds? I sure didn’t. Click here for an astounding story with a couple very interesting, if somewhat gruesome pictures. Okay, I’m a Googler; look what I found: a video clip of the same trick and another here where the big bug catches and eats a mouse! Sheeshhh! I've been having a hard time at home these days; birds are regularly hitting my new kitchen window. I finally hung bird netting over the thing, not tight...but wrinkled, bent and moving a bit in the breeze. It's helping. Good lord, I was finding several every weekend; the only reason I didn't come home to the poor things at night is a cat has figured out where to get an easy meal. Ugg... I feel so irresponsible! I know full well that when I heard that sickening thump and went out to find a bird on the ground, keeping it safe for an hour or so till it could fly does not mean the poor thing lived. Generally they just fly off and die anyway. It's too sad. However, I've discovered some really cool stuff: a film ya put on the window which looks like a shade from the outside, but which you can see through from the inside! I've contacted the company and plan to buy the stuff as soon as I can. You can read all about the easy-to-install stuff here, and order it here; it keeps UV-rays down, too. Bird mortality at human-built structures receives relatively little public attention, but structural hazards are actually responsible for more bird kills than higher profile catastrophes such as oil spills. Human-built structures have been recognized as a hazard to birds for more than a century. However, the accelerated rate of urban development in recent years has seen the proliferation of radio and television towers, office buildings, power lines, cooling towers, emission stacks, and residential housing, all of which represent an increasing threat to flying birds. In the dark, and especially in foggy or rainy weather, the combination of glass and light becomes deadly. Confused by artificial lights, blinded by weather, and unable to see glass, birds by the hundreds and even thousands can be injured or killed in one night at one building. Over 140 different species of birds have collided with buildings in Toronto alone. One expert estimates that across North America, up to 100 million birds die in collisions each year. Many species that collide frequently are known to be in long-term decline and some are already designated officially as threatened. Compared to habitat loss, pollution, and over-hunting, the issue of building collisions is neither well-known nor adequately understood. Yet across North America, more birds die from collisions each year than succumbed to the Exxon Valdez oil spill. Birds migrating at night are strongly attracted to, or at least trapped by, sources of artificial light, particularly during periods of inclement weather. Approaching the lights of lighthouses, floodlit obstacles, ceilometers (light beams generally used at airports to determine the altitude of cloud cover), communication towers, or lighted tall buildings, they become vulnerable to collisions with the structures themselves. If collision is avoided, birds are still at risk of death or injury. Once inside a beam of light, birds are reluctant to fly out of the lighted area into the dark, and often continue to flap around in the beam of light until they drop to the ground with exhaustion. A secondary threat resulting from their aggregation at lighted structures is their increased vulnerability to predation. The difficulty of finding food once trapped in an urban environment may present an additional threat. I really hope you consider this stuff. A First - unusual for an old broad! And, I have a confession to make. All my books are still packed in boxes while I remodel my home; including my bird-books…and I’m in a quandary. 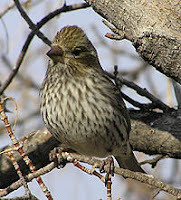 A small, smooth bird with red head, face, bib and upper base of tail with strongly stripped bellies, wings and backs in brown and buff. Another similar to the first, but in Industrial Orange, rather than red, at least one of which blends to yellow low on it's throat. 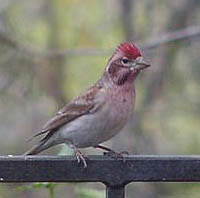 One which has a spiky crimson top-knot like a punk-rocker boy overlaid with brown facial markings, with the red continuing down the bib but with a pale breast and belly. 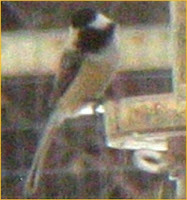 And finally, another small bird in pale pink along its entire underside with slightly darker face and bib. This bird has pale tan markings much like the others, but less stripy. I want to learn which bird is which breed and which females belong to whom. I want to learn how to identify wild birds. I mean it, too! 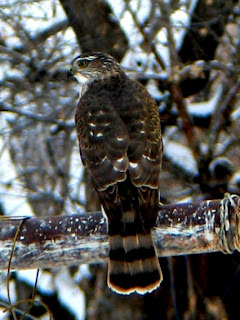 Here's a shot of some kinda raptor who frequents my feeders, too. S/he's been coming around regularly. If anybody can answer any of my questions please just leave a comment; I'd appreciate it! About seven years ago, I got early retirement, sold my home and bought 40 acres near La Veta Pass in Colorado. Before I moved in, the stock-market mess of 2001 happened and my 'retirement' was lost by about two thirds. I moved in anyway, and lived alone, off-grid, at 9000' in the Sangre de Cristo Mountains; I learned a lot. Click here for the little story of my time there. The old website will be moved, I'll try to get back with a new address when that happens. After three years I had to get a job and to make that happen, needed to move into town. I've done that and now live in a sweet little home, near the river and surrounded by huge cottonwood and willow trees. 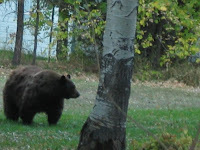 My neighbors include local deer, black bears, the occasional mountain lion, bob-cats, foxes…all manner of small animals and birds from huge eagles to several tiny hummingbirds…and about 900 or so other characters than myself. It’s a delightful community. I live in an area of mixed Riparian and Montane and high mountain forest…best described here …and I’ve re-discovered the joys of bird-watching, to the point I wonder if I’m a budding birder who’s saving pennies for a Digiscope! White-breasted Nuthatch, Black-capped Chickadee, Mountain Chickadee, and every manner of Junco Dark-eyed Junco, Slate Junco, Pink Sided Junco, White-winged Junco. 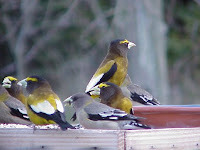 Pine Siskin, Lawrence's Goldfinch, Lesser Goldfinch, Rosy Finch, Grey Crowned Rosy Finch, Brown-capped Rosy-finch, House Finch, Purple Finch and the lovely Evening Grosbeaks. Who knew they had teal beaks in breeding season? (see second, older, shot). Magpies drive my dog nuts (they eat his food) and American Crow and Common Raven abound. Black-chinned, Broad-tailed, Calliope, Rufous and, I believe, Anna’s Hummingbirds have all been here. Anna’s are the beautiful little green ones. Meadowlarks sing in the pastures all the time, and blue-birds are here, as well. I plan on putting up boxes this year. Turkey Vultures are exciting to watch in their tree around the corner, as they open their wings to warm up before taking to the drafts in the morning. I am glad the tree is not in my yard, however. Cooper’s or Sharp-shinned or Ferruginous or Rough-legged Hawks, Red-tailed and/or Red-shouldered Hawks; Bald Eagles and Golden Eagles, Osprey, Peregrine Falcons and Northern Harriers…but I know there are many other raptors. I once saw a tiny little Merlin or was it an American Kestrel? Long-eared, Great Horned, Barn, and Great Grey Owls are here; I hear some hooting at night and see them from time to time. I’ve seen Common or Lesser Nighthawk in the road, too. The thing is, I’ve decided I’d like to know more about the birds. Like the little raptor I saw, or perhaps the bird so much like the exotic (to me) Evening Grosbeaks, but with red on it’s head…I want to know what I’m seeing. I want to find like-minded folks with whom to hike the area while birding. 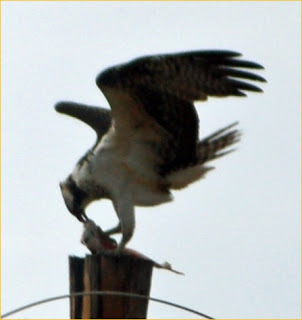 A new friend just sent me this shot he got a couple days ago at Daigre Reservoir in La Veta, CO: An Osprey, thanks Joel! Please feel free to leave comments or answers to my questions; I'd appreciate it!